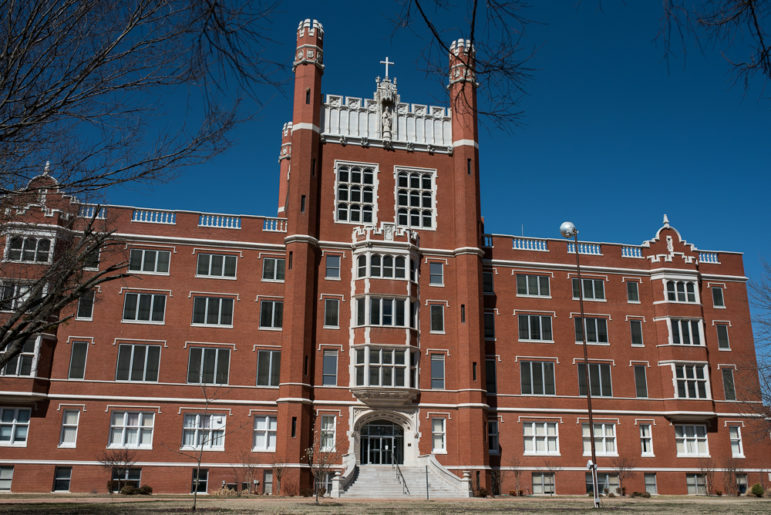 Benedictine Hall is the main iconic building that greets visitors to the former St. Gregory’s University campus in Shawnee. St. Gregory’s University was a Roman Catholic, four-year liberal arts college in Shawnee run by the Benedictine monks of the abbey. The school dates back to 1875, and the Benedictine monks who founded the school aimed to educate both Native Americans and settlers moving to Oklahoma. In November, university officials announced it would end operations at the end of the fall semester. The closure came as a complete shock to many students, faculty and alumni. The university had a staff of 400 and enrolled 800 students, according to its latest nonprofit tax return. The university’s 16th president, Michael Scaperlanda, was inaugurated in March 2017; he helped create the university’s strategic plan, “Vision for Our Next Century”. Less than a year later, the school filed for Chapter 7 bankruptcy and closed. The strategic plan hinged on a $20 million loan from the U.S. Department of Agriculture, which ultimately the university failed to qualify for, court records show. Financial woes had troubled the university for years. The university owes a total of at least $15 million to creditors, which include the Citizen Potawatomi Nation, the Catholic Order of Foresters, and more than 180 businesses and individuals, federal court records show. Both the Catholic Order of Foresters and the Citizen Potawatomi Nation are suing the university in Pottawatomie County District Court, saying the property mortgage was used as collateral for loans now in default. Both entities filed their agreements in separate foreclosure cases. St. Gregory’s had entered into a succession of agreements with the Citizen Potawatomi Nation. In July 2015, the tribe gave the university $5 million in exchange for full scholarships for tribal students. The agreement states if the university defaults by failing to maintain accreditation or denying scholarships, it would transfer the university to the tribe within 60 days. The Catholic Order of Foresters did not have the same agreement. The stated intent of the tribe’s arrangement was to keep the university open and minimize disruption for students and staff. The tribe and a related entity have claims totaling more than $7 million against the university, secured by the mortgage. But the campus is valued at $28.5 million, according to the bankruptcy filings. On Nov. 13, five days after the university announced it would shut down, John “Rocky” Barrett, chairman of the Citizen Potawatomi Nation, mailed a notice of default to the university president and other officials. The tribe’s attorney asked a judge to intervene and issue a temporary injunction to stop the school from closing. A hearing was scheduled for Dec. 27, but the bankruptcy case halted the proceedings. The university closed anyway. Tribal police are now patrolling an empty campus. The abbey and a museum on campus, the Mabee-Gerrer Museum of Art, remain open. The university’s bankruptcy is pending in federal court in Oklahoma City. An auction to sell off the university’s assets is expected soon.